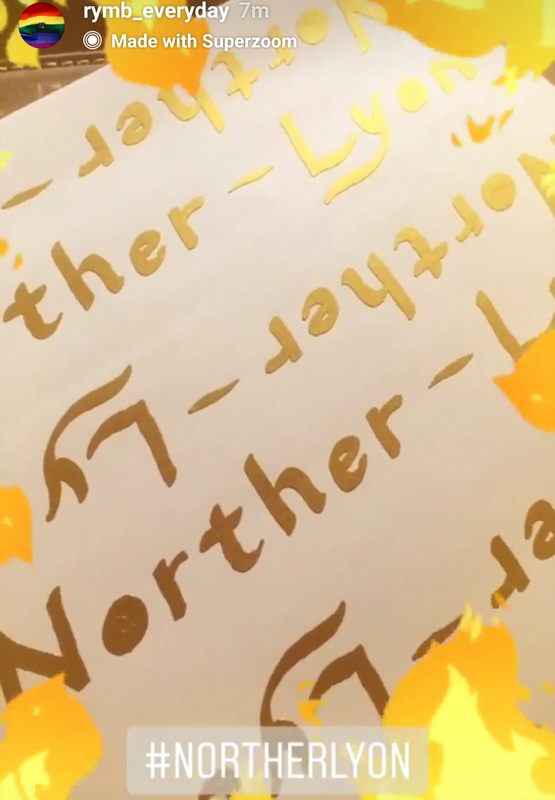 Above: Doug H’s Norther Lyon. The last shot is on the walkway over the Hudson. “300 miles on the bike and having loads of fun with it despite the chilly temperatures. 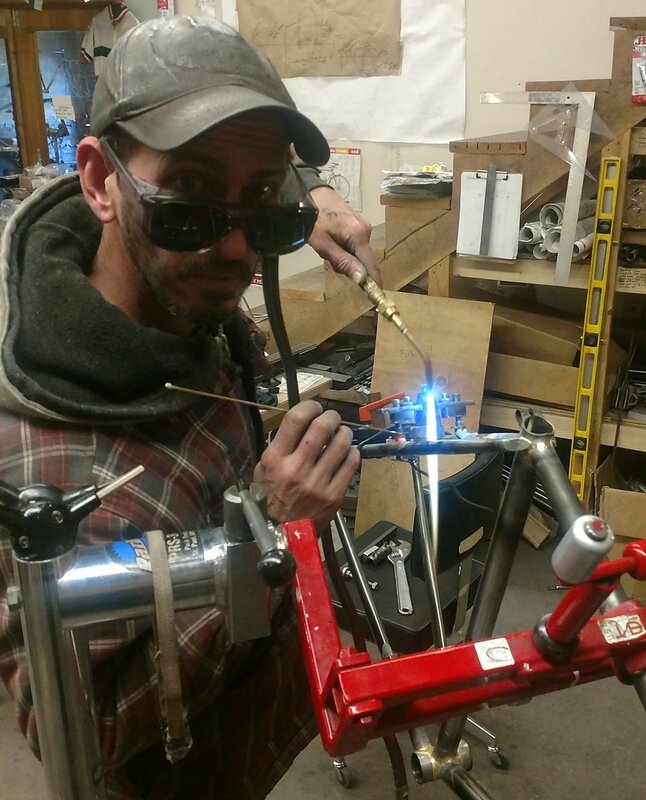 It gets a lot of compliments!” -Doug H.
Below: 2/11/2019 Jeff drops off the batch of 58cm Norther Lyon frames. Mark is helping the Fed Ex guy load out the 56cm Norther lyon frames getting Bike Flighted to their new homes! Mark getting right down to brass tacks getting those bridges in! Sorry it’s basically updates and photos for the first third of this page. If you want all the details and specs scroll down. I’ve also added a section on racks at the bottom of this page right before the Q&A. The 58cm frames are all ready for powder coat, we’re just waiting for the bikes at powder to get done so we can drop this batch off. Jeff has already started on the next batch, its 54cm so get in touch with us if you want one that size. No scheduled batch after that so we’ll need to see what people want. Put in your order and we’ll do that size next! Jeff’s planing on adding smaller 50cm and even smaller batches this year so hit us up if interested. 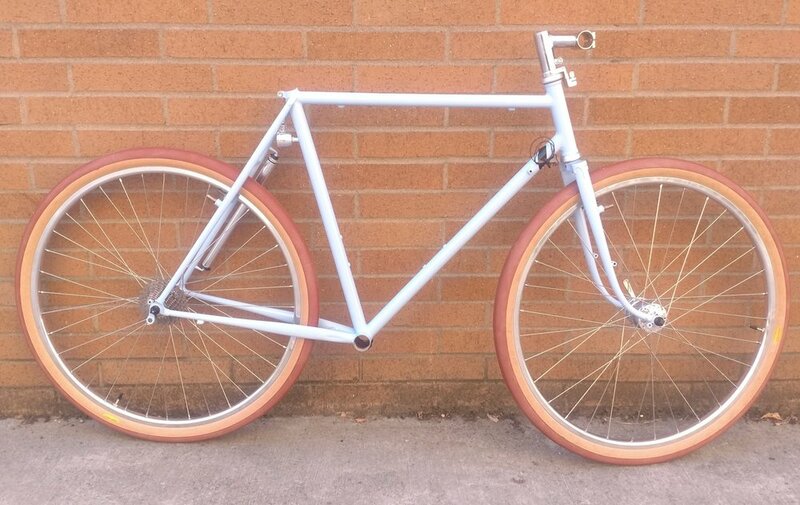 Here’s some picks of Craig C’s 52cm Norther lyon all built up and getting miles. Note it also has a set of custom made lowriders made to fit the Compass CP-1 rack without light mount. “I’ve got almost 100 miles on it now and really love it. So smooth!!! !” -Craig C.
Here’s some picks of Dough H’s Norther Lyon. It’s the first one to get decals, and have us do the full build up on it! Check out these picks! 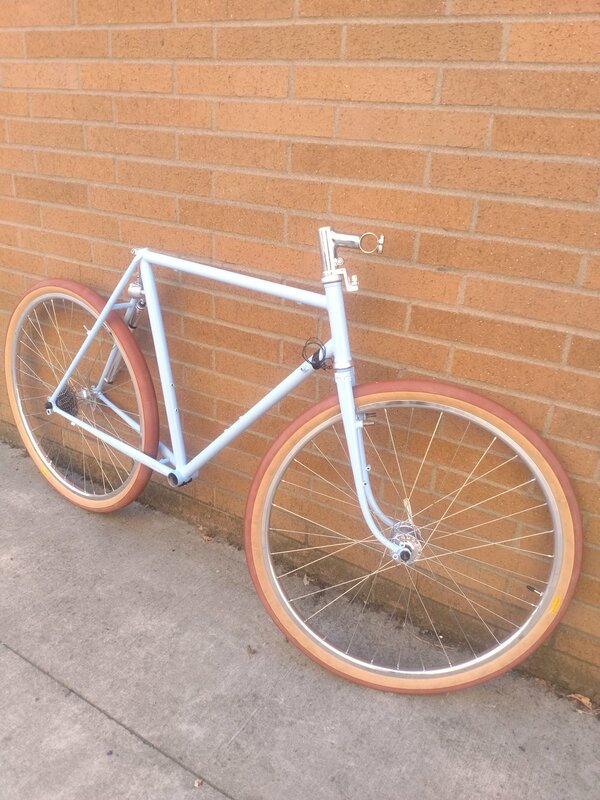 Check out these Picks of the Norther Lyon prototype frame all built up by it’s owner John S. in Perth NSW Australia! He just finished it and will get some ride shots to share asap! Very cool, and it’s nice to see one built up! Below are some progress pics I took while doing the braze ons on a batch of 52cm Norther Lyons! Note the picture of the Nitto rear cable stop. It’s the smallest one out there. We’re recommending them for the 52 and smaller frames. We have them available for $25. We pre-installed some parts for the customer’s before shipping them out. The rest of the build they’re going to do locally. Some pics are in good indirect light and some are in direct sunlight to help give an idea of the color. It’s about impossible to capture the true color, and everyone thinks they look way better in person. The overhead pic of the seat lug/cable hanger is the closest. The last 54 cm got a full build! 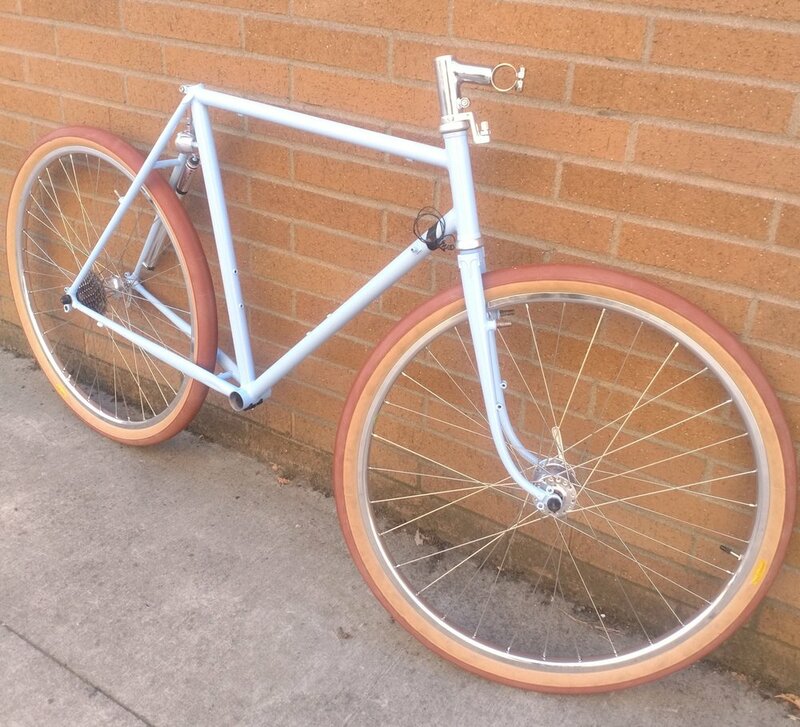 So here’s some pics of Doug H’s Norther Lyon all built up: Frenchy Blue, threadless, Compass brakes and CP-1 rack Sun XCD rear hub and derailleurs, Son Wide Body Deluxe front hub. 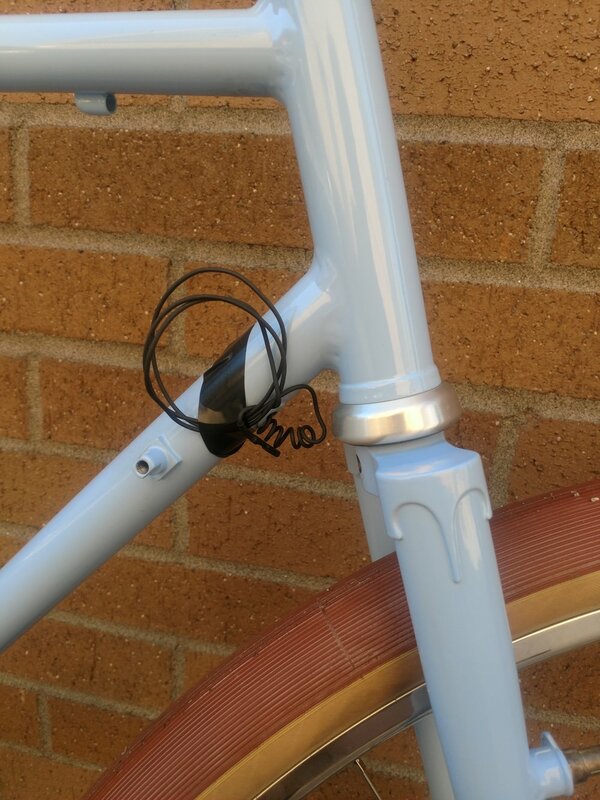 And, the Miche headset, special front cable stop, Tanaka decaleur, IRD bright silver stem. Check out the Sine Wave USB stem cap! We're worked with the wonderful artist and bike mechanic Spencer Hawkes of Nomad Patches on the art. Check out these final drawings of the head badge, seat tube badge and the down tube decal. Note the NL and then the blank space on the bottom of the seat tube badge. We’re going to hand stamp the number of the frame into the badge and then place them on the bike like the 531 or other tubing badges of the past. Don’t worry Jeff is still hand stamping serial numbers into the bb shells. 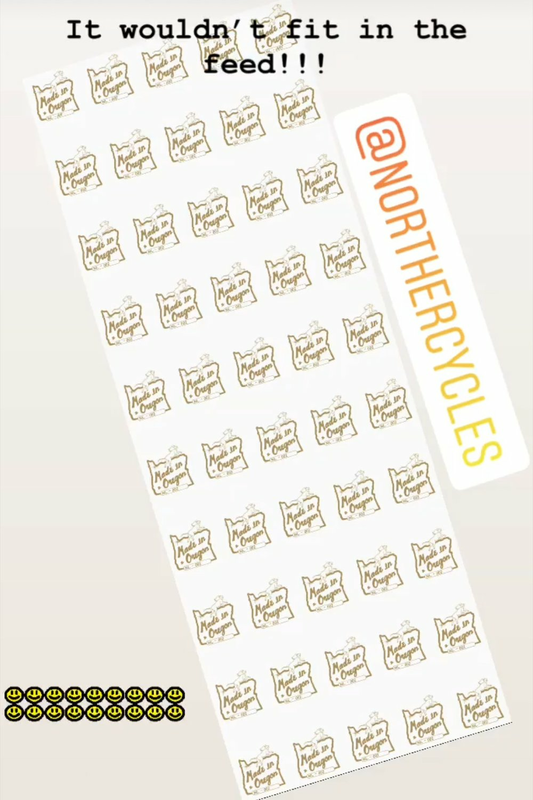 The amazing RYMB, or Ride Your Motherfucking Bike is making all the decals for us too. He just does the best work and is a pleasure to work with and has lots of other awesome stickers and decals. I use his coffee mug all the time. Check him out! Check out these shots of some of his decals he’s done for us so far. 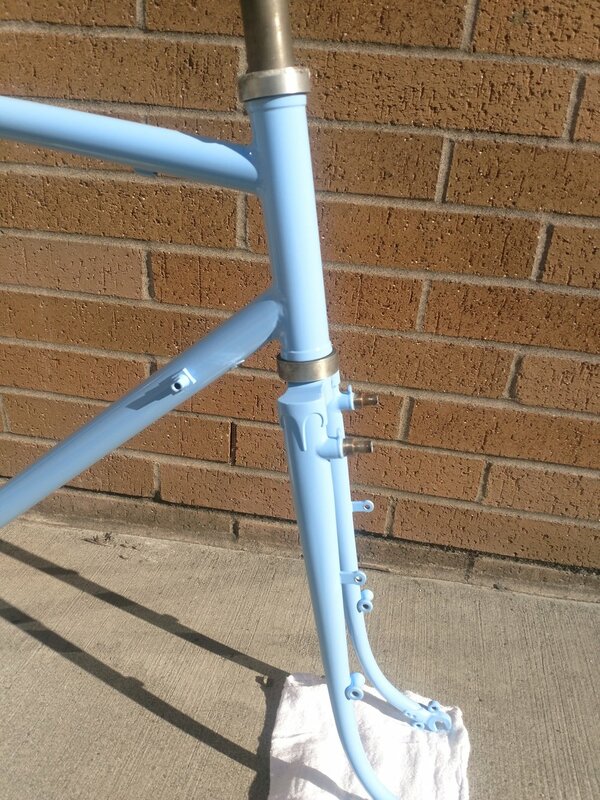 Check out these pictures of the first prototype pre being sold and built up by John S. in Perth! It now lives in Perth NSW Australia! 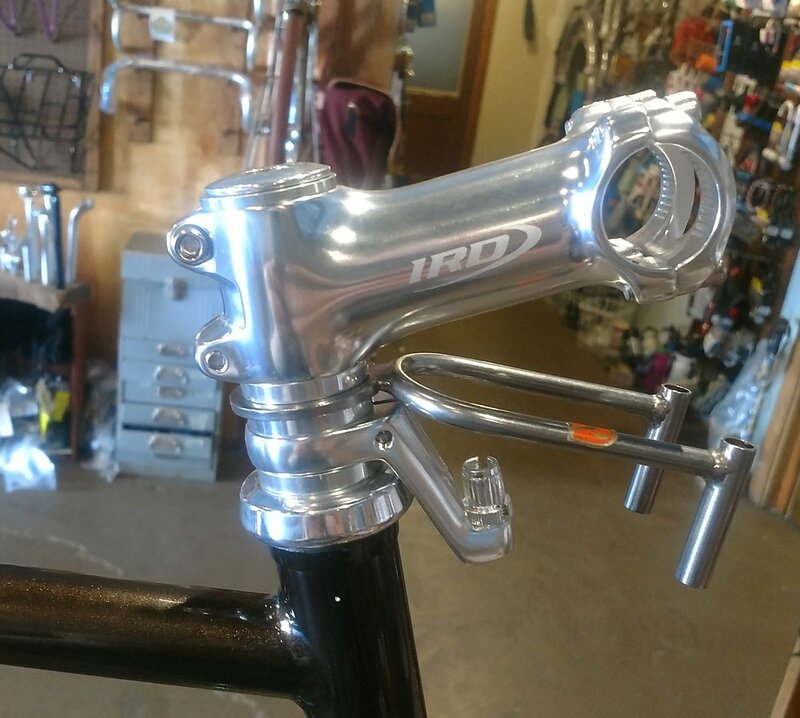 Check out these pictures of the prototype with a one inch threadless headset and IRD bright silver stem installed. Above are some pictures of the headset set up on the Norther Lyon collaboration prototype. I used the NOS Miche 1in threadless headset, (*custom polished). This set up also has a clamp on front brake cable stop, one inch headset spacers, and a one inch shim to shim the common 1 1/8 stem to the one inch steer tube, and a Velo Orange Decaleur (use the one inch one). I've stocked up on these bright silver IRD stems in many lengths, angles and bar clamp diameters; hit us up for availability. Check out these photos from the first batch of 54 cm frames. Above are some picks of Michael L’s 54cm Norther Lyon stem set up. This is the Compass 1 1/8 threadless stem sitting on top of the 1in front cable stop with a 1in headset spacer on top. The spacer supports the 1in Miche top cap and is mandatory with a 1 1/8 stem on the one inch steer! So is the 1 to 1 1/8 stem shim. 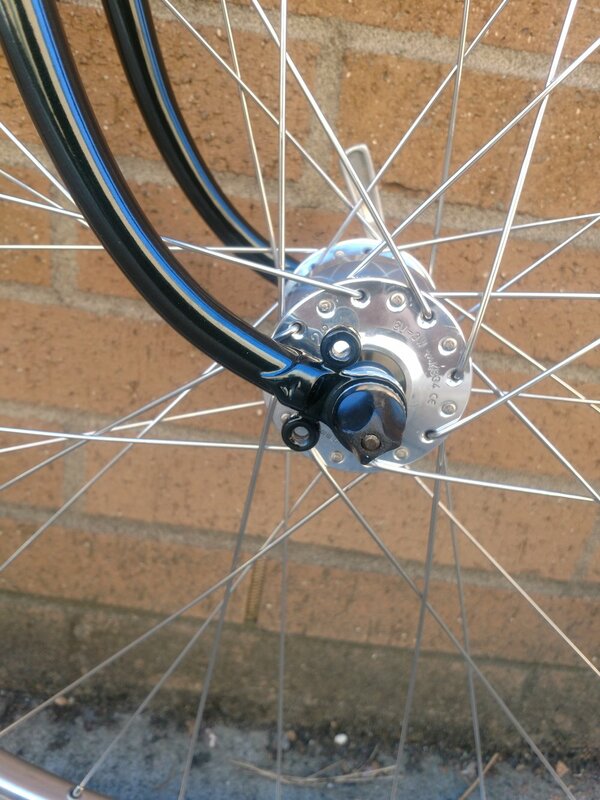 Notice how the Compass 1 1/8 threadless stems outside diameter perfectly matches the Wheels Manufacturing 1in spacer! I'm working on a blog post about setting up the threadless headset for this bike, but it will be a while before I can get enough pictures. *Pics of the headsets by themselves are to demonstrate the difference between the stock finish on a one inch threaded Miche headset and the finish of the custom polished one inch threadless Miche headset. 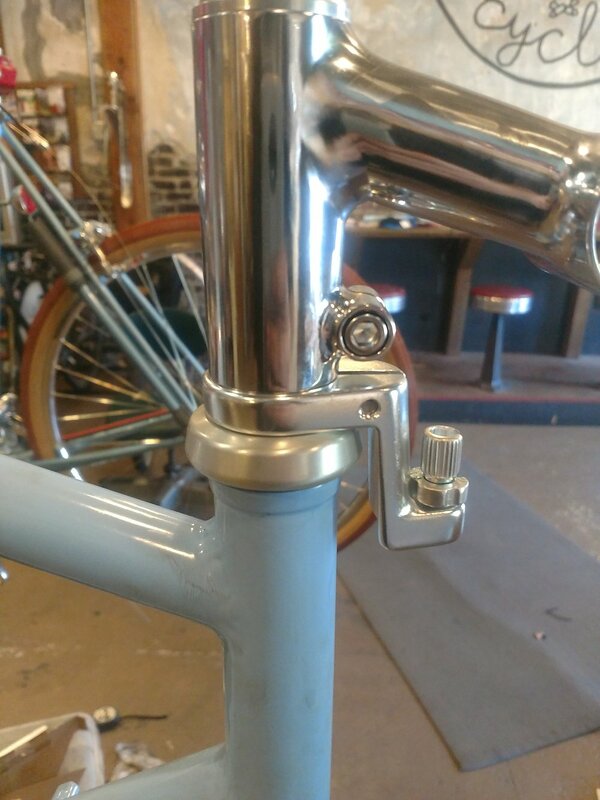 Here are a few shots of Doug H’s 54 cm Norther Lyon stem set up. IRD 6 degree stem with a Wheels Manufacturing headset spacer and Velo Orange bell mount spacer. It also uses a Problem Solvers 1” to 1 1/8 stem shim and a very cool Sine Wave Cycles USB charger stem cap. Yes we do have these available! 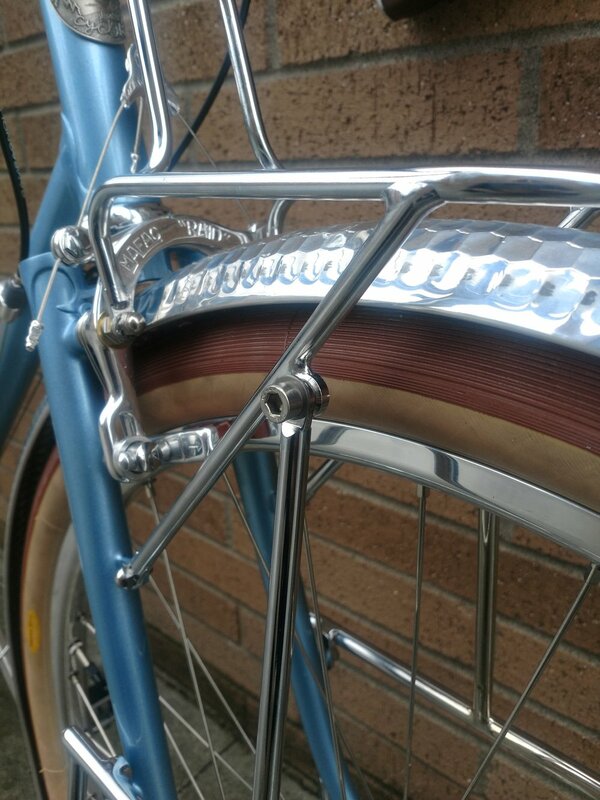 The second photo is the same bike, but we exchanged the spacers with the Tanaka Decaleur and Tanaka 1” shim. We did the full build on this bike and have lots of pictures up at the top of this page! Order yours! Pre-orders and down payments. 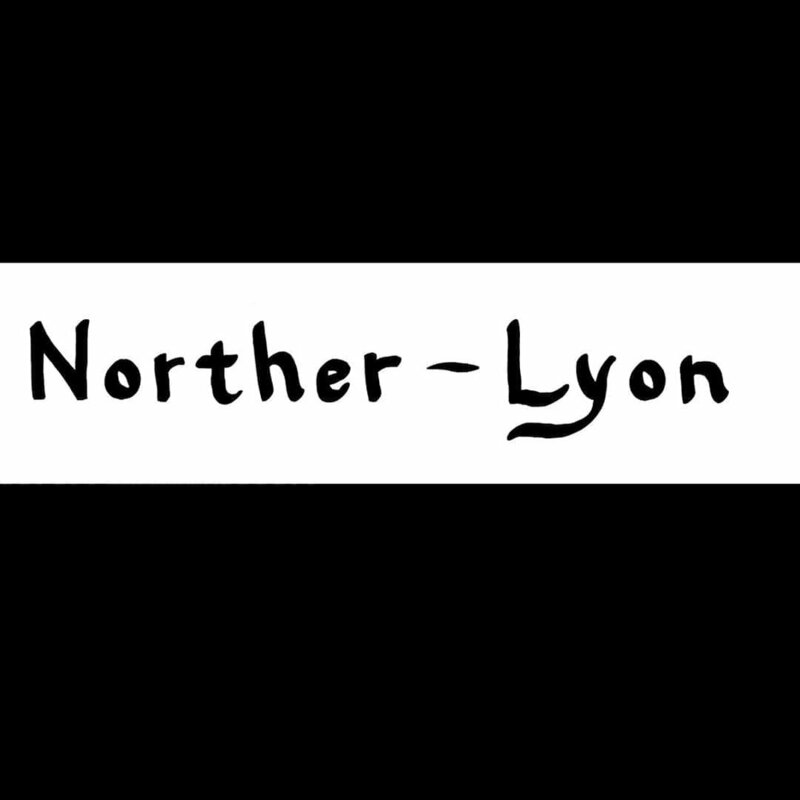 The Norther Lyon is a silly inexpensive, (for what you get), ode to Jan Heine and his thoughts and reviews in Bicycle Quarterly and Jeff's 44 years of frame building experience, and a little of our touch mixed in too. They are all made with a custom mixture of extra light 7.4.7 high quality tubes from True Temper, Kaisei, and Reynolds 853 (* with 8.5.8 down tube for the best flex and performance characteristics). So light and nice that we're recommending a “maximum” rider weight of right around 180lbs-ish (this is only a recommendation not a law, or exact science, we're not cops, do what you think is right for you). They will all have the Kaisei super supple "Toei Special" fork blades and the light, (hollow), and elegant Compass 54mm fork crown. 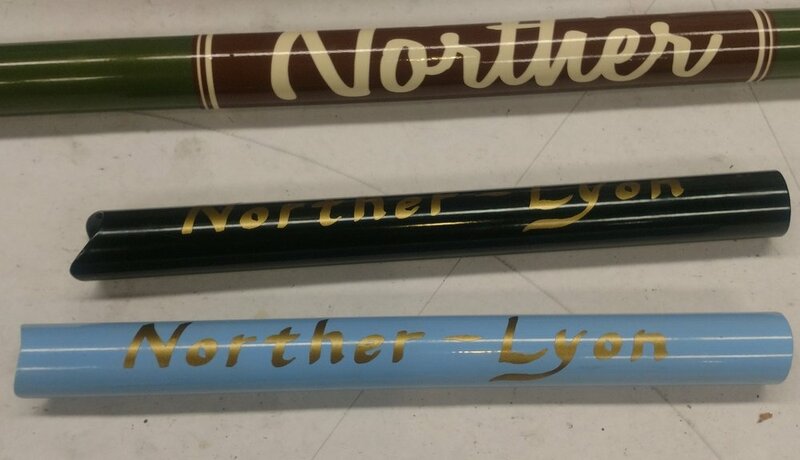 The Norther Lyon will come standard with 1in threadless forks (You can talk us into a one inch threaded steer tube for quill stems upgrade for $50). 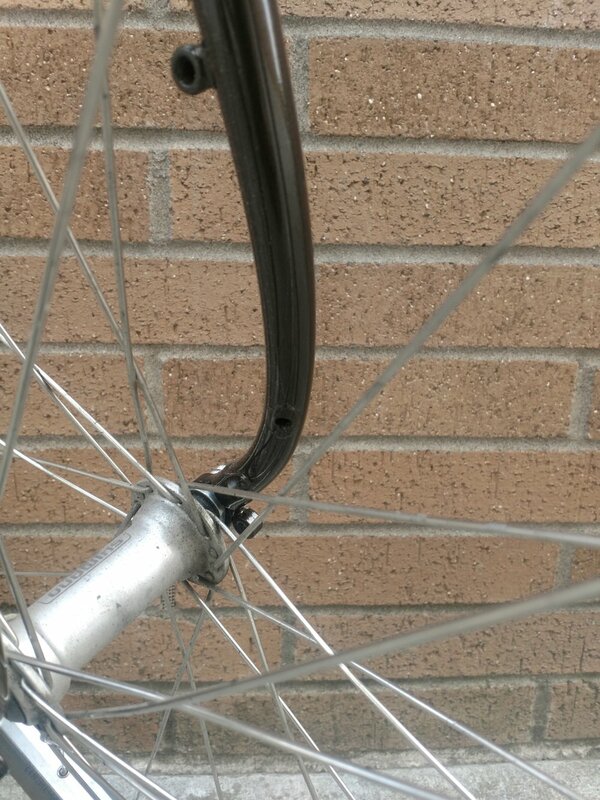 Standard braze ons will include a single rear fender eye on each rear drop out for fenders. Double eyes on the front drop outs, as well as mid fork barrels for fender and lowrider front racks. The fork will also come with a custom under the Crown boss for front fender mounting without having to use a Daruma or L bracket (very trick!). Same for the the chain and seat stay bridge! The frame will have two sets of water bottle cage bosses: one on the down tube and one on the seat tube, (Sweet talkers can get us to add a set for a third bottle on the under side of the down tube for $50); traditional down tube Shift bosses (these will work with any down tube shifters or bolt on cable stops for bar ends or brifters); three split cable stops: two on the top tube for the rear brake and one on the chain stay for the rear derailleur. 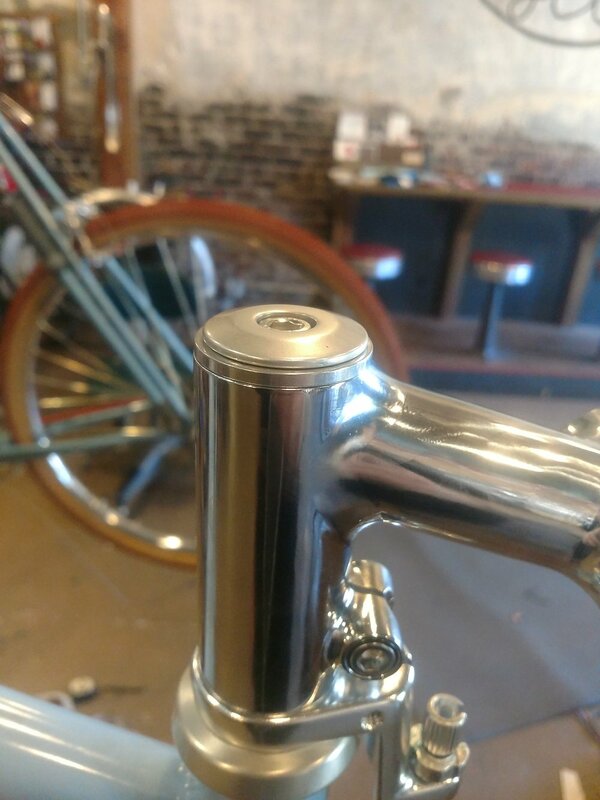 The bottom bracket shell will be drilled and tapped for a replaceable cable guide (included). The seat binder lug is designed for a single M-6 x 20mm bolt (included). There is also a pair of pump pegs on the non drive seat stay for a modified Lezyne Road Drive size large frame pump. ( We have a stash of these pumps already modified and available for an extra $59). 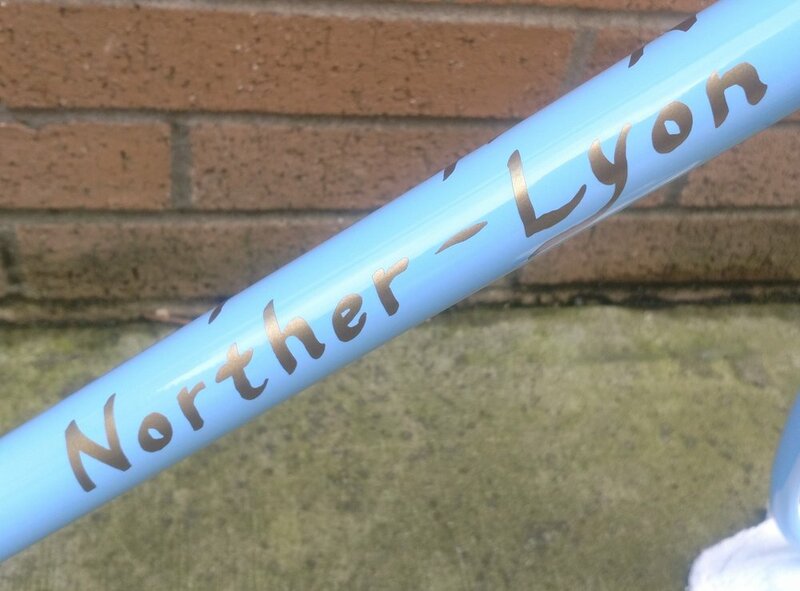 All Norther Lyon frames are dynamo ready with two reinforced holes in the fork, and one in the down tube, and a driller hole in the bottom bracket shell for internally running the dynamo wiring, (for rear fender mount dynamo lights). This way all your dynamo wires can easily be run internally! 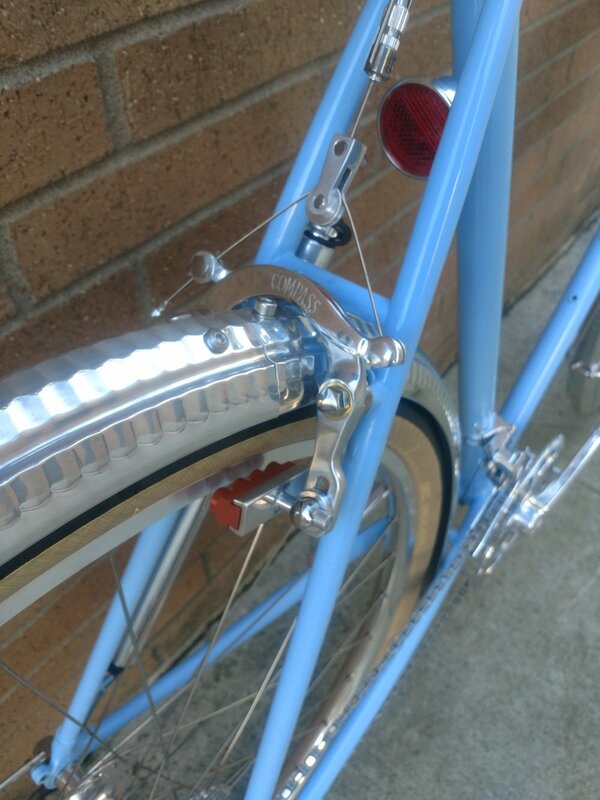 Size 54 and larger frames can be upgraded to the Compass tail light braze on for $50 + $169 for the light itself. (We have and will make more blog posts on how to run dynamo wiring, and are also more than happy to provide this service to your frame before handing it over to you for $40 per dynamo light/USB Sine Wave Charger). 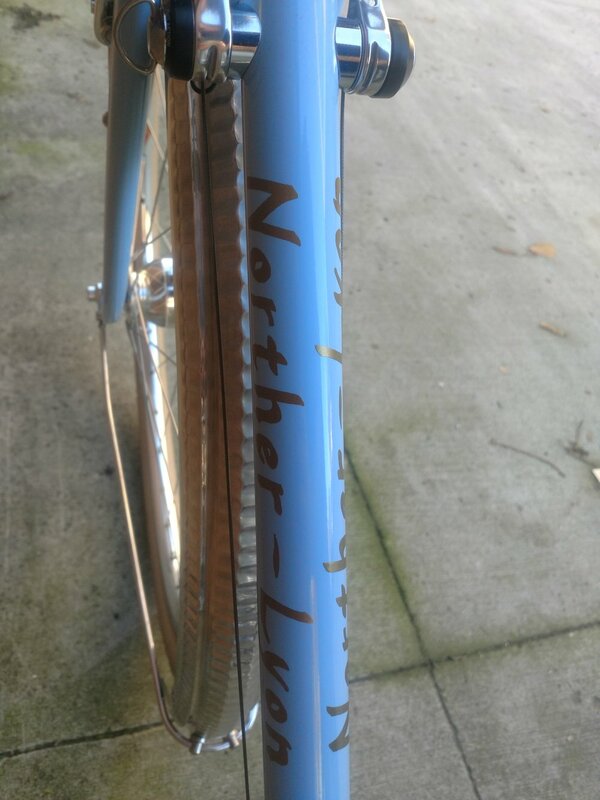 Norther Lyon come standard with Cantilever brake bosses placed to fit the Compass Rene Herse, or our Norther modified, or any other standard canti bosss. Upgrade to Compass hard mount brake bosses for Compass Bicycles hard mount center pulls for $200. These mounts also work for vintage M.A.F.A.C "Raid" brakes. Frames upgraded to hard mount studs will come with Compass braze ons for the Compass CP1 front rack. 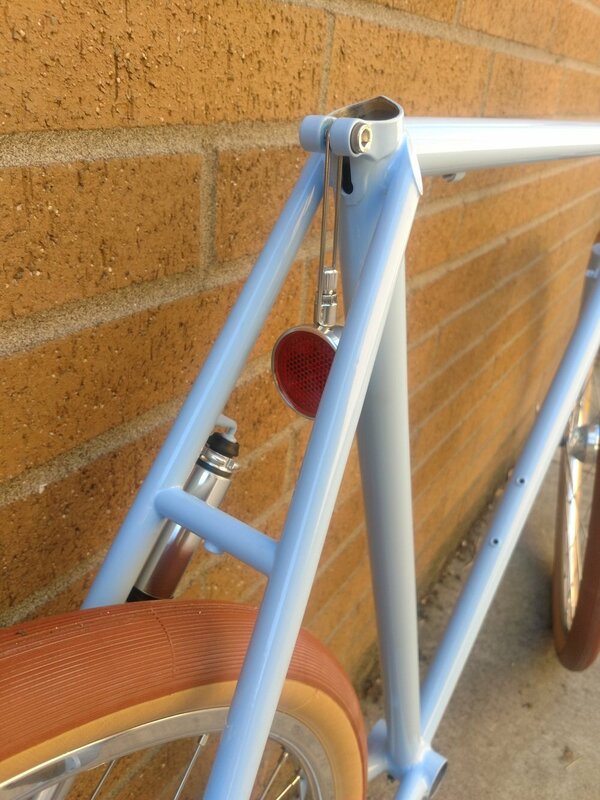 For the Canti boss version we recommend the Velo Orange Randonneur front rack for cantilevers. Or even the Compass UD-1 rack with the stays going down to the mid fork mounts. 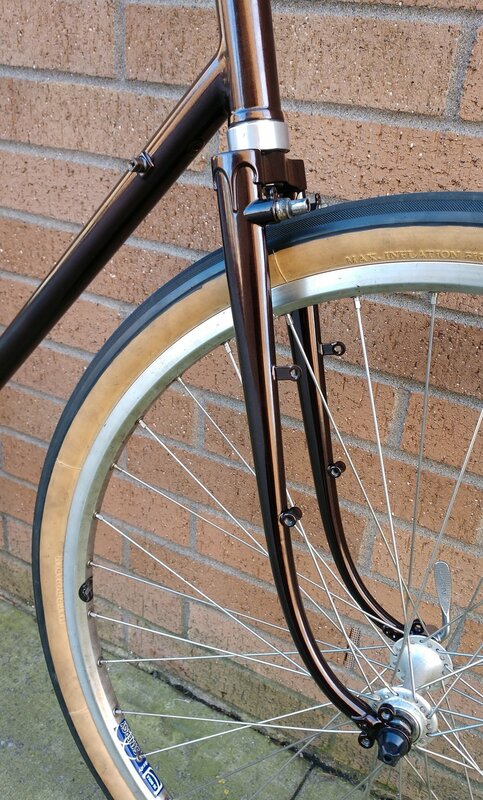 (We have these brakes and racks available and would prefer if you order it from us with your bike). We can also make a custom rack or rack set for you, see our custom rack page. Same goes for custom made lowrider racks to fit the CP-1 without light mount or the Compass “Mule” style. See the rack fitting section near the bottom of this page for notes on racks and what will and wont fit. $200 up charge for Compass/M.a.f.a.c hard mount stud brake bosses and Compass CP1 rack mounts. $50 up charge for one inch threaded steer tube, or third set of bottle bosses, (or Compass taillight mount on 54 and larger frames). *Prices are subject to future change and may go up slightly every 6 months to a year or so. Putting a deposits down will lock in your price! Inch to 1/18 stem shim $5 (lets you use any standard 1 1/8 threadless stem on your 1in threadless Norther Lyon). Silver 1in threadless front cable stops $15 (Locks onto a threadless steer tube and doesn’t hit the headset requiring a spacer underneath it like most other brands). 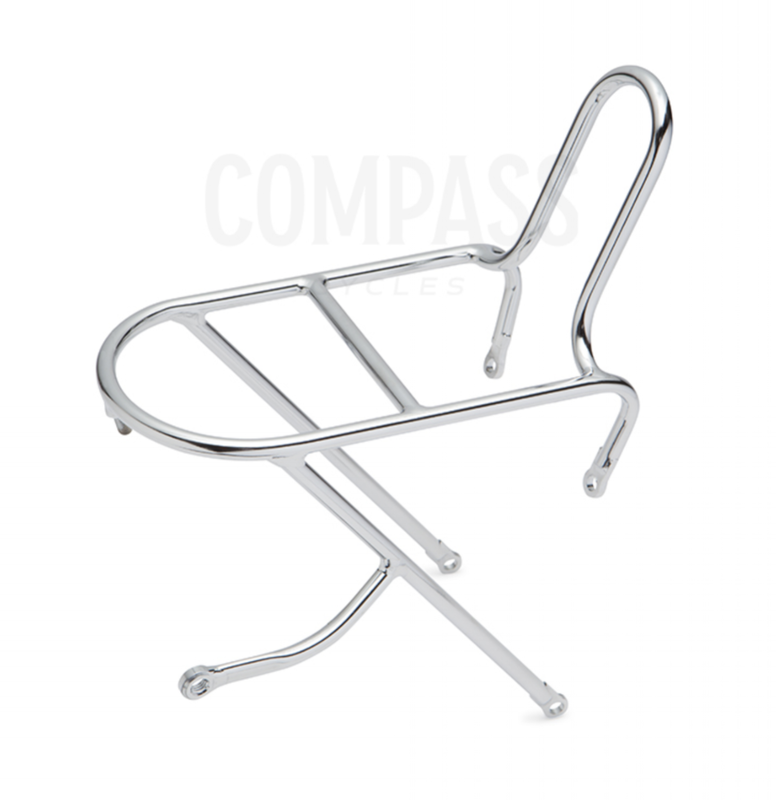 Compass Rene Herse Cantileve brakes and hard mount center pulls and CP-1 racks, as well as any of their other parts and accessories will be price matched to their current listed retail price. 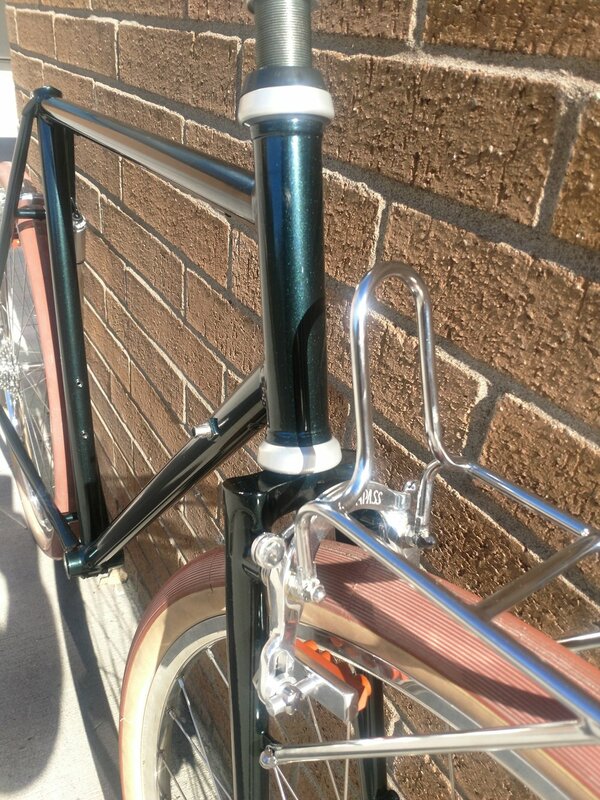 Velo Orange racks, stems and other parts and accessories will be price matched to their current listed retail price. We also offer many great NOS, Polished, blended, and custom parts and accessories, including polished brakes, in our Shop section. And we have a lot of treasures in stock in our physical shop, but not up on the website including Custom Polished and chromo chrome plated "no logo," Nitto quill stems and decaleurs, and custom Honjo fenders with special domed hardware and polished stays. We can put a group together for you with NOS 9 speed Shimano 105 derailleurs, rear hub, Shimano 8, 9, or 10 speed down tube shifters KMC chain and Sram 11-28 cassette. Or, Sun XCD group with cranks, derailleurs, rear hub and Shimano 8, 9, or 10 speed down tube shifters KMC chain and Sram 11-34 cassette. Or Micro Shift classic silver 9 speed group with Micro Shift derailleurs, 9 speed integrated brake/shift levers, or shimano 8, 9, or 10 speed down tube shifters with KMC chain and Sram 11-28 cassette. We also have an in house custom wheel building shop, Stoic Wheels, that can get you any rims, spokes and hubs you want and expertly build them. He's an SP dealer as well as stocking Son hubs. We recommend these hubs and Velocity Atlas rims. We are also now recommending the new Velocity Quill rim. *Components, accessories, installation labor, and shipping are extra. Order yours today! Pre-payments or down payments. Put your deposit down to lock in your prices and fill the batch (full batches get made first!) You can pay online, but we'd strongly prefer if you mailed us a check! (Made out to, Norther Cycles and shipped to 5515 N Albina Ave Portland OR 97217). Currently offering sizes 52CM, 54CM, 56CM, 58CM and 60cm. 52 cm seat tube measured center to center. 53.8 top tube center to center. 74 degree seat tube angle. 72 degree head tube angle. 70mm rake of fork rake. 36mm of trail with a wheel flop of 11mm. 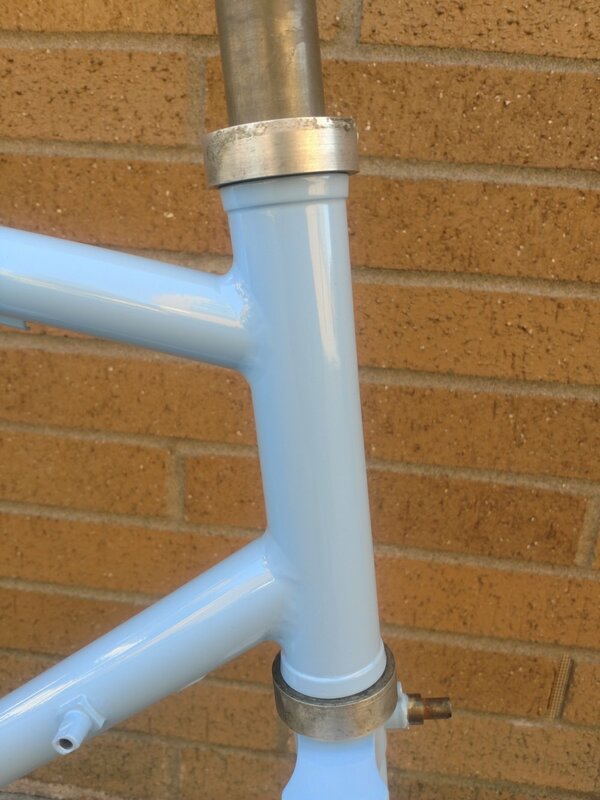 71mm of bottom bracket drop. Chain stays are 44cm from the center of the bb to the center of the rear axle. All frames have 1in head tube extension built in. (So you don't have to use as many headset spacers). 52cm stand over will be right about 78cm. 54cm seat tube measured center to center. 54.5 top tube center to center. 73.5 degree seat tube angle. 38mm of trail with a wheel flop of 11mm. 54cm stand over is 79cm (measured from the ground to top of top tube). *This frame set fits 650b x 42mm tires with fenders, and 650b x 48mm tires and fenders with a little dimpling/squesing of the fenders. 56cm seat tube measured center to center. 56cm top tube center to center. 73 degree seat tube angle. 73 degree head tube angle. 32mm low trial with 9mm wheel flop. 56cm should have about an 82cm stand over. 58cm seat tube measured center to center. 57cm top tube center to center. 58cm should have about an 84cm stand over. 60cm seat tube measured center to center. 57.5 top tube center to center. 73.5 head tube head tube angle. 68mm fork rake with 29mm trail, 8mm wheel flop. Stand over should be right around 86cm. *Note: on 60cm frames, Jeff recommends them made with a single over-sized, but still 7.4.7, like all the other frames, super light tube set. But will do them out of standard sized tubes if you insist you can stand/get away with a super flexie bike. *Stand overs are an approximation, and my poor math skills, and can and will probably be a few mm lower depending on rims and tire fit. As frames get physically made I will measure them and update the measurements. *All numbers subject to change slightly as I get clarifications and corrections from Jeff. 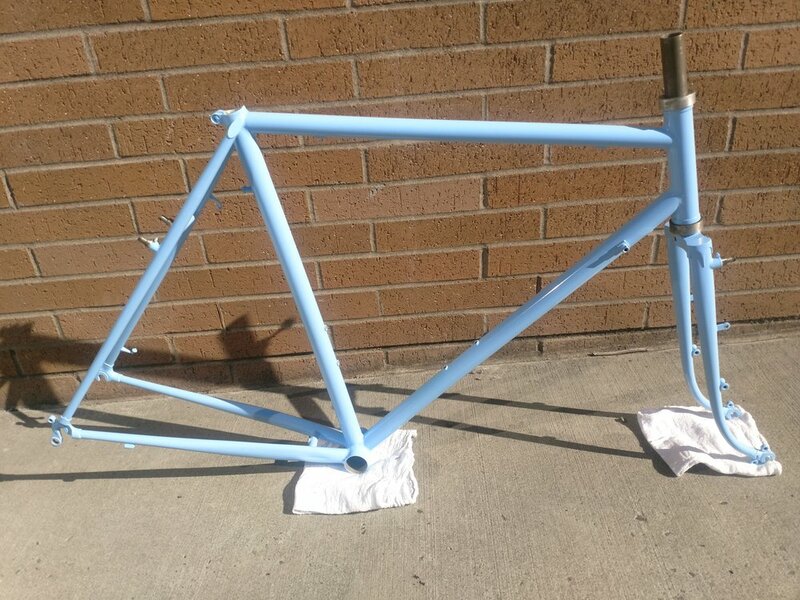 A very light 5.89 pounds frame and fork for size 56cm threadless prototype. Bronze Metallic Brown. Prismatic color Lazer Copper PMB-4151. 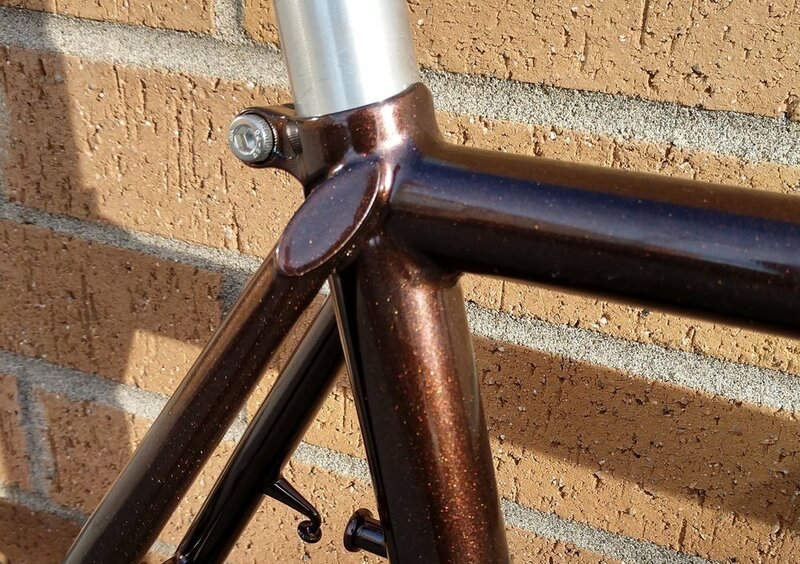 Lazer Copper is a dark brown base with a heavy copper metallic. This color is a polyester metallic powder coat and has a high gloss finish. Fine Dark Teal Metallic. Prismatic color Misty Aquarius PMB-4245. Misty Aquarius is an aqua blue and dark teal combination with a heavy metallic. This color is a polyester metallic powder coat and has a glossy finish. Frenchy Robin's Egg Blue. Prismatic color Troll Blue PSS-2657. Troll Blue is a light sky blue. This color is a polyester solid tone powder coat and has a high gloss finish. Gloss Black. Prismatic color Ink Black PSS-0106. #1 Gloss Black In The Industry. Prismatic Powders developed Ink Black to be the only high gloss black powder coating you will ever need. Ink Black has an incredibly deep, mirror like finish with amazing flow out, yielding the highest gloss, true black finish available in a powder coating. Sorry no other light colors. They're a pain and usually don't make the logos pop. In the future we might let the first pre-sold bike customer pick the batch color. We'd save money and time and really prefer to do each batch all the same color. *This is another good reason to put your deposit in now, not only will you lock in your price, but you can pick your color. Check out these pictures that make me super happy. This is an often overlooked detail, and it's perfect on these Norther Lyon frames. The seat binder area has lots of room for any rear cable hanger you like! 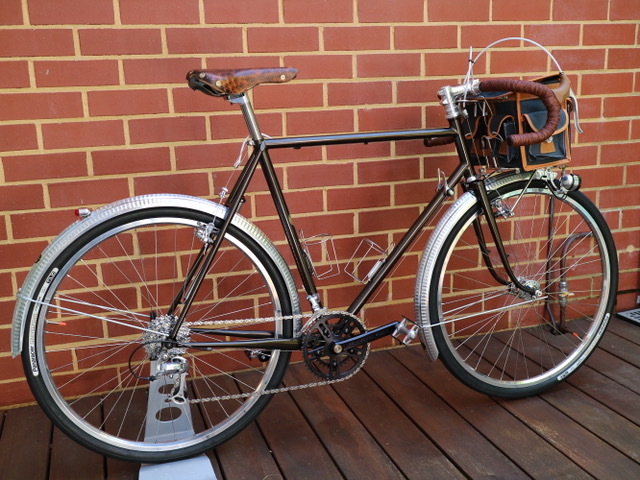 We like the Surly Bikes one because it's all stainless and has a barrel adjuster. They look even better polished! Nitto ones and the Rene Herse one will fit too. We have all of these and a few other in stock! 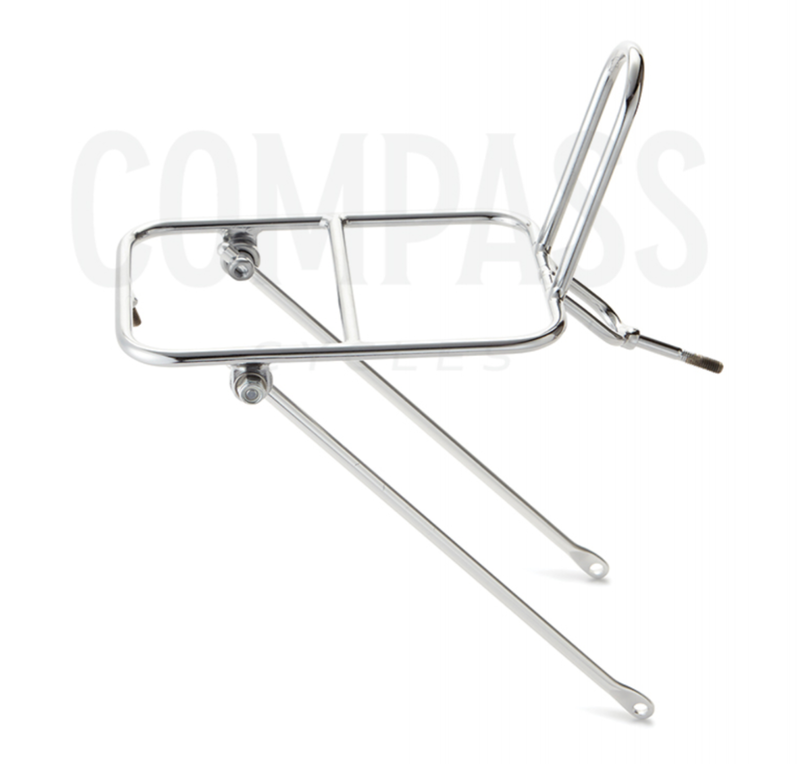 If you choose the hard mount option for Compass or Mafac Raid brakes then you can use the Compass CP-1 rack. It’s light, high quality chromed and fits pretty amazingly well for a production rack with no adjust-ability. It comes in two options. Either with an arm on the left (wrong) side, or without the arm. 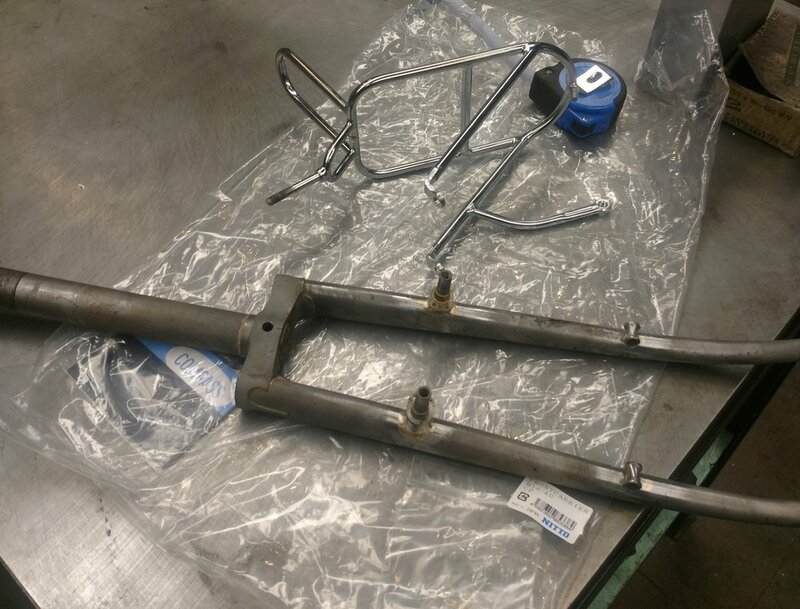 The version without the arm has a threaded boss on each side so you can attach a light mount, or as we like to do make custom detachable lowrider racks and attach them to the threaded bosses on the rack! Here are some pics of the CP-1 rack on aNorther Lyon. This is the “with light mount” version, but it’s hidden in most of the photos. Here are some pics of a Norther Lyon with the CP-1 rack “without light mount,” and custom made detachable lowriders. Now if you pick the Cantilever brake option things get a little more complicated. Compass does sell a light elegant canti boss rack called the M-13 wide… but it’s not quite as impressive as the CP-1 rack they make for the hard mounts brake option. The stays are a little to short and a little to narrow to hit the brake bosses well. So it will have to be gently persuaded to fit. (This means bent!) It’s also a little low and tight where fender clearance is concerned. 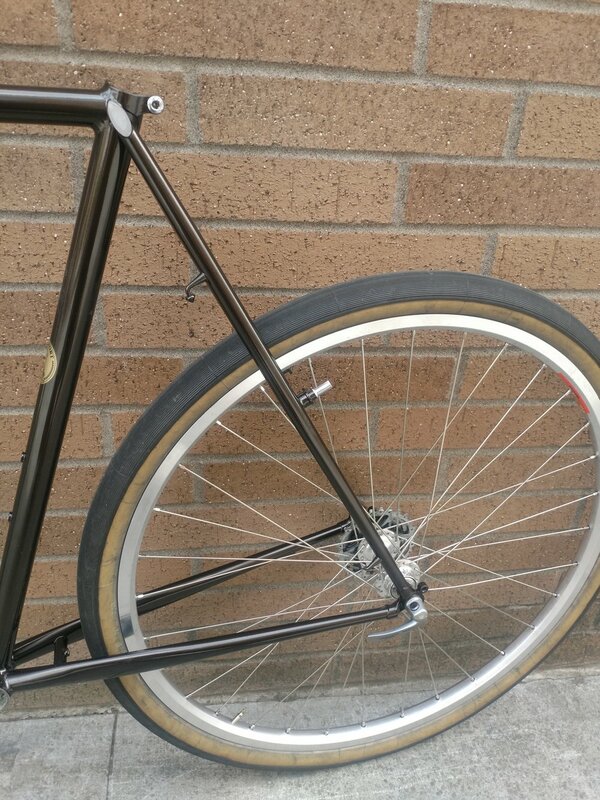 It only has 20 mm of fender clearance instead of the perfect 25 mm we build into all our bikes. The threaded boss on the front of the rack that’s for hard mounting the front fender is also at the wrong angle… just slightly. It also comes with a very thick leather washer that doesn’t help the situation. I think this rack is still usable, but it will take some trick fender installation work and a custom 1 mm leather washer instead of the super thick 5 mm one Compass provides (we will provide a 1 mm washer with them if you order it through us, we can also pre-bend the rack to “fit” as best as it can on your Norther Lyon fork). This rack also comes in two options, one with the light mount arm on the left side, and without. But the without option only has a single threaded boss, not one on each side like the CP-1, so no detachable lowriders for this rack. We can do the Compass “Mule” style though. Here are a few mock up picks of the Compass M-13 wide rack on a Norther Lyon fork. Compass also makes a rack called the UD-1. This rack will work with the Canti version of the Norther Lyon if you don’t plan on using lowriders. As this rack will need the lowrider mounts for the lower rack stays to attach to. They have no light mount, but you can use an extra set of the hardware that holds the stays to the rack as a light-mount! We have them available too! 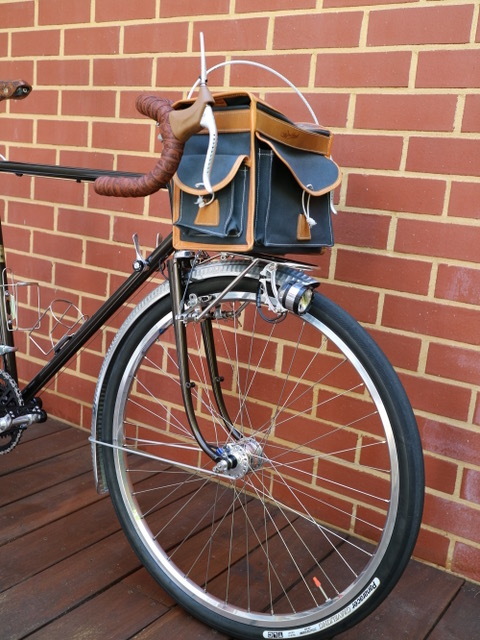 The other option for cantis is the new Velo Orange Canti mount rack, or even their front Tourist rack. Not as light and elegant as the Compass racks, but still a nice bright silver (stainless steel), and they fit/are easy to make fit. Some other racks may “work” but I don’t recommend them for a number of reasons I won’t get into here. 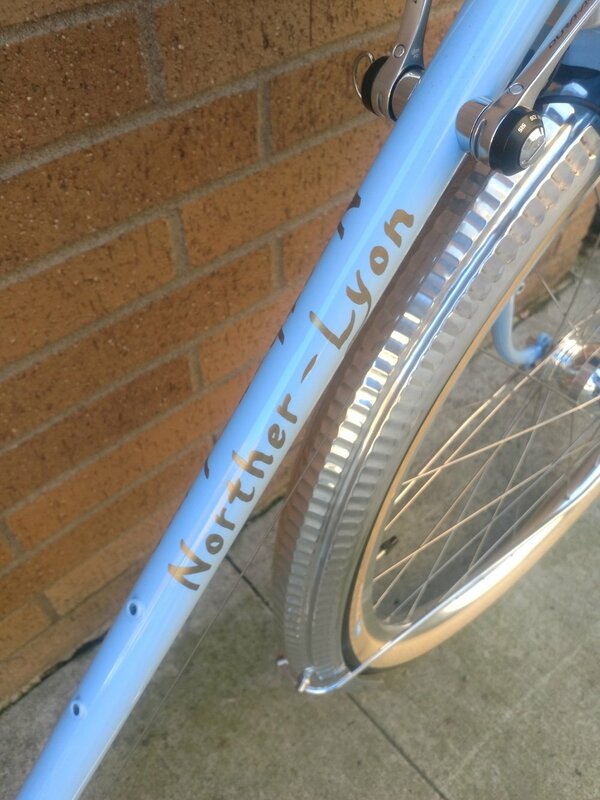 Here are a few shots of a Norther Lyon with the Velo Orange Canti rack. Note the bolt on light mount made of a bit of old chain ring. As mentioned above we can make custom detachable lowriders for the CP-1 without light arm. We can also make a custom “Mule” type detachable lowrider rack set with the big U type brace. We have custom rack pricing on our Custom Work Pricing page. There are a lot of stock lowrider racks out there for sale, but so far none that I don’t dislike for one reason or another. If we find a good option that fits and isn’t cheap flexible scary junk I’ll add them here. If you know of one that will work/you like please send us pics/links and we’ll try them out! Here are some picks of one of our custom bikes with a Compass CP-1 rack “without light arm” and custom detachable lowriders made to fit. I'm anticipating a few questions so lets answer them here. Hey, I want to do an bunch of stuff this bike isn't designed for, will you please tell me it's designed to do what I want!?! No. It's designed to do one thing very well. If you want to do other stuff it probably won't work as well as a bike designed to do that other stuff, but again we're not cops and aren't telling you what to do, so do what you think is right for you. We just want to let you know that it's not a touring bike, gravel bike, hover craft, or space ship. It's not made for vintage hubs, or odd sized seat posts, or big cruiser bars. It is what it is, and it's awesome! Why want it to be something else??? Hey, isn't one inch threadless obsolete? We'll yes, sort of, but not really. It was replaced quickly with oversized 1 1/8 threadless, so there were not a lot of headsets and stems made back in the day. Many frame builders and an occasional new bike still use this size and Jeff said that 90% of the custom bikes he's made are one inch threadless. Several companies still make headsets including IRD, Cane Creek and Chris King. I've also acquired a large stash of NOS needle bearing Miche headsets in anticipation of these bikes being popular. They’re available for only $65. I always strongly recommend needle bearing headsets on low trail and dynamo tail light equipped bikes; and don't recommend sealed cartage bearings on low trail and dynamo taillight equipped bikes as they can cause some issues like poor grounding of the taillight and fork shimmy while bombing hills (although most riders will tell you that you can just rest one knee against the top tube while descending and it will counter act most of the fork shimmy). Shims from one inch to 1 1/8 stems are cheap and available so you can use any modern and plentiful 1 1/8 stem. 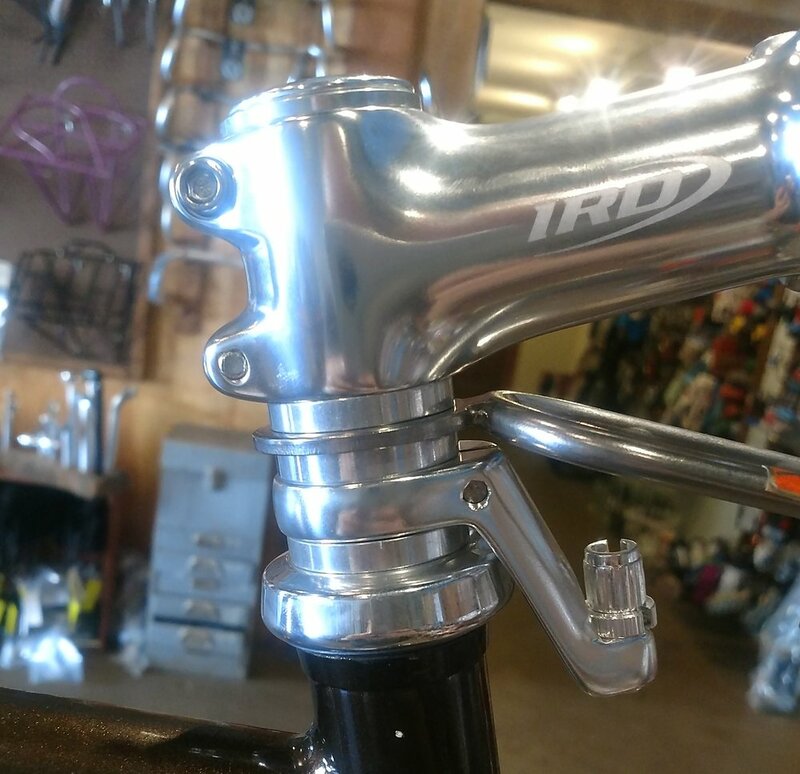 We have a nice selection of IRD bright silver 1 1/8 thread-less stem, Velo-Orange and Compass Cycles also have very attractive ones (and we'd be more than happy to sell you any of them and install them if you like). The Compass stem even has a great decaleur solution and drop spacers kits! (I also make a prototype decaleur for four bolt threadless stems!) There are a few NOS and used one inch threadless stems out there if you want to search. 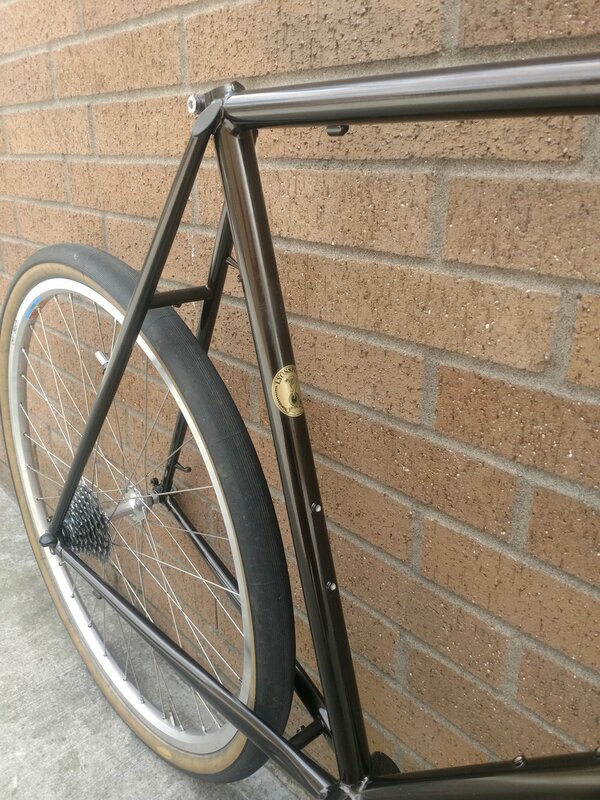 Many frame builders will make you a custom one too. 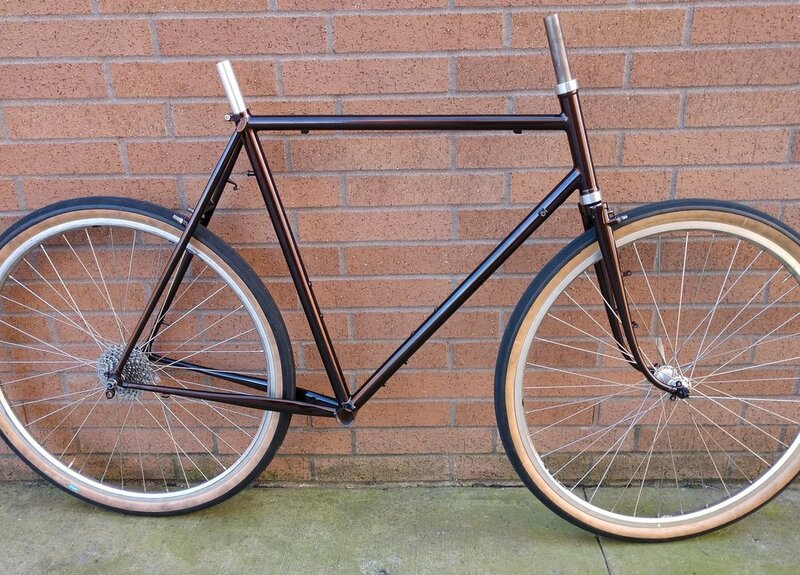 We may also make some matching no file fillet batches of stems for these bikes if there is enough interest. We'll keep you posted if we go that way. Hey, are there, or why aren't there, rear rack mounts? No rear rack braze ons! Yes we know they're common on lots of bikes and people think they like rear racks because they're common. No that doesn't make them good, Low trail bikes don't like to have weight on the rear, and these aren't touring bikes. They're really light weight performance low trail bikes and they wont ride optimally with rear racks. 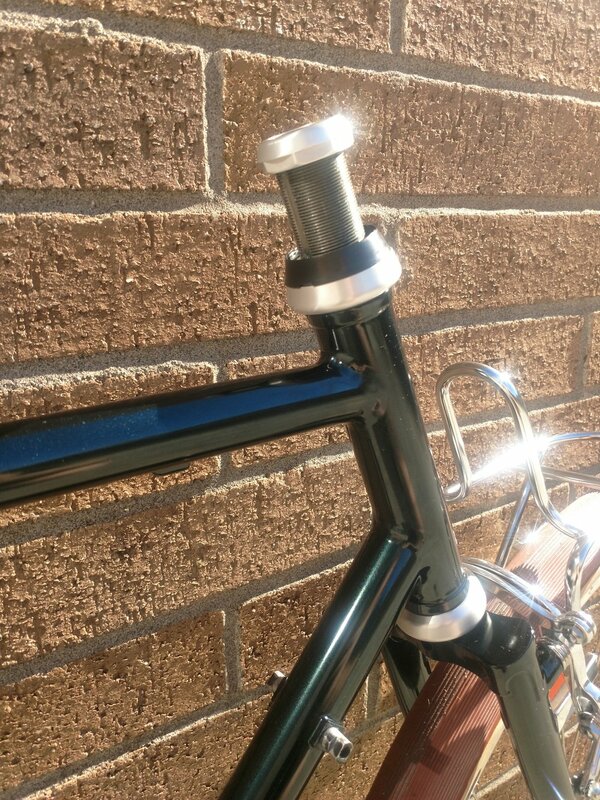 They have lowrider mounts on the fork for larger loads that wont fit in your handlebar bag. And these bikes are made to carry weight up front and be ridden exclusively with weight up front (which is the best way to carry weight on a bike anyhow). Are you going to do 700c bikes as well as 650b? Jeff would like too, so I'm guessing the answer is yes, although I'm not sure why anyone would want one when 650b ones are available? 650b!!! I don't know when this might happen and don't have any more info on it as of now. If you’re interested let us know as it will make us more likely to get around to it sooner if people are actually interested. I'll update the website and post it all over Instagram when we do! Are you going to do a disk brake version? No. Disk brakes make a huge amount of torque and break light forks! You have to have a super heavy duty stiff fork and that defeats the whole point of ultra light super supple bikes! Will you customize it--change the braze ons, change the frame sizes, do mine with lugs, change the trail, make it for internal hub or belt drive? Nope! The only way to make them this cheap is to batch them out and make them all the same, (or at least pretty similar). If you want custom stuff, you need to order a custom bike. These are as is just like every other batch bike, or off the shelf bike (sort of, as we let you pick the color and brake/braze on options). Mark and Jeff think it's a mistake to offer any options at all, and if it becomes a huge hassle i'm going to get rid of all the options we do have! If people waste too much of my time i'm going to remove the options and they'll all be threadless and for Compass hard mount brakes. 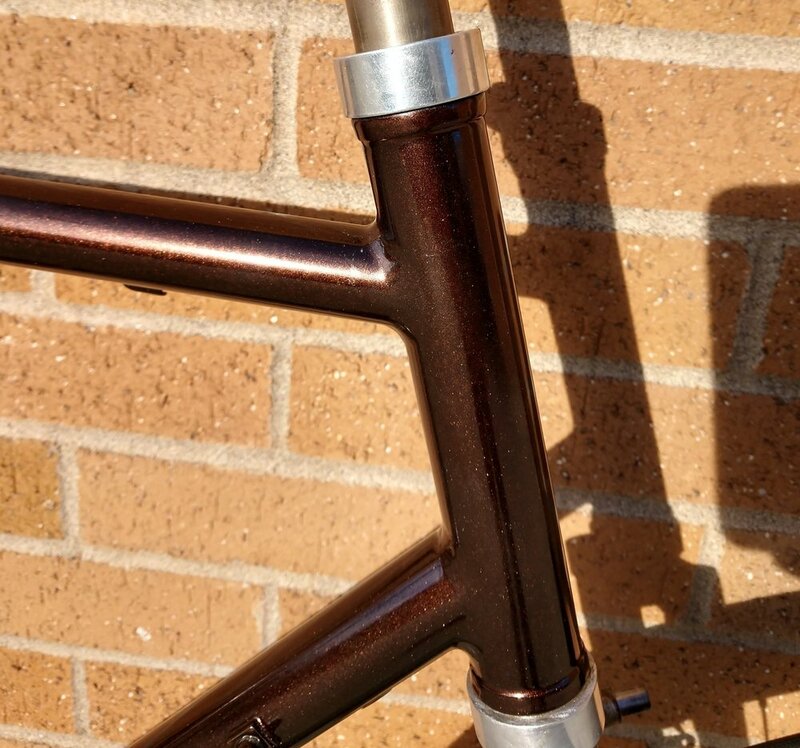 This being said, someone asked if he could get his without the mid fork braze ons for lowrider racks, and if he could get it without a powder coat job, (as he has a local painter he likes to work with). Turns out the answer was yes! Much easier to omit a few details even though it's a bit of work to keep double checking and to make sure we leave off a braze on that all the other bikes are getting. It can feel wrong as we're constantly double checking to make sure we aren't forgetting anything. Here's a cut and paste of several good questions I recently answered for someone interested in ordering a Norther Lyon. Think you might find them interesting too. What fender do you recommend width etc? 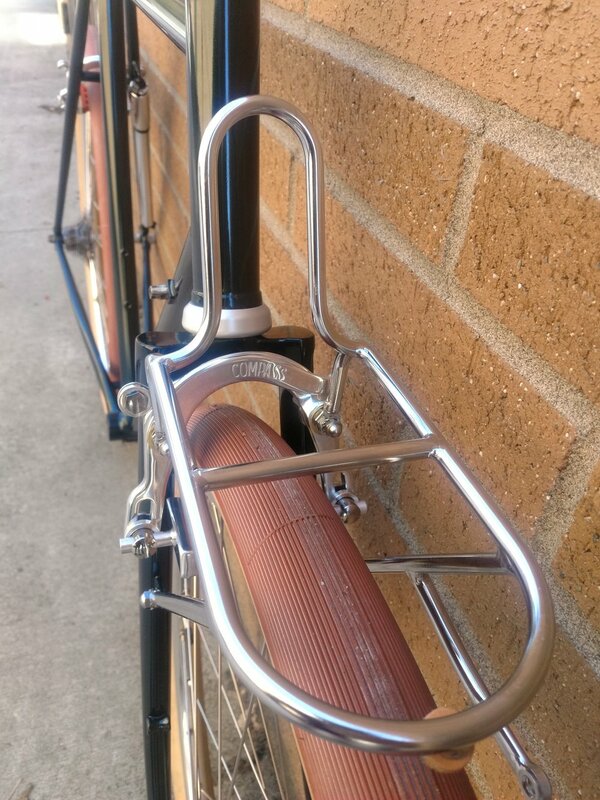 I'm a fan of the Velo Orange Zepplin fenders for their hight and width and ease of installing, but anything that says it will fit a 650bx42 tire will probably be fine. I am not familiar with the fender mounting you describe (no daruma no L bracket) – in your experience has this worked well? How much clearance is there between the tire and the inside of the fender? 22mm perfect for a clean 20mm of fender clearance and a leather washer! 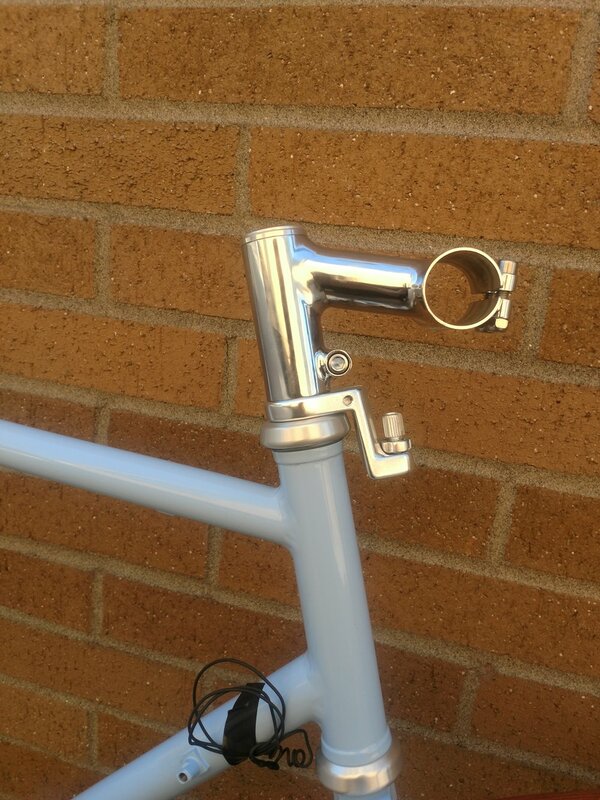 The compass mount(and light) mounts on the seat tube – does the wire go via the bottom bracket and up the seat tube? How much clearance is there if a SKF bottom bracket is used? Is there space for the electrical cable to stay internal? Yes, it's tight but plenty of room. The light needs to be installed first. And we have a whole photo essay blog post about this, and are more than happy to do it to your frame before shipping it to you. Then you just need to make sure you don't snag the wire and damage it between the threads of the bb shell and the threads of the bb while inserting the bb, (we're also happy to do this for you). What is bottom bracket threading and width? Standard old school English threaded, with a standard 68mm shell. This number depends entirely on what width bb and the brand of cranks. They're all different, but there's room for even the tightest fit such as t.a. cranks and the correct bb width for said cranks. 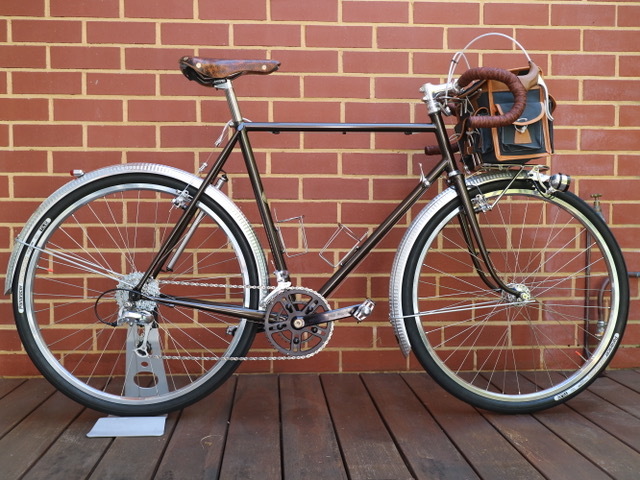 Yes we designed these bikes with the 110 SKF bb and Compass Rene Herse compact double cranks. Plenty of room and no modifications needed to make anything fit and work! (This is actually the trickiest part of designing a good rando bike)! What is smallest distance from bottom bracket to front wheel and fender (toe overlap) I might work this out from the dimensions/angles you give but its always good to have an actual measurement to confirm. Everyone is so concerned with this number and it's totally not important... Like at all. Especially on low trail bikes, with longer then normal fork rakes and smaller 650b wheels. You'd have to have a custom frame made with the shortest top tube ever and freakishly long feet to have this be a problem on a low trail bike. I would like to try the Miche needle bearing headset – polished of course. More of a statement than a question, so no problems here! They come in both threaded and threadless just like these bikes. 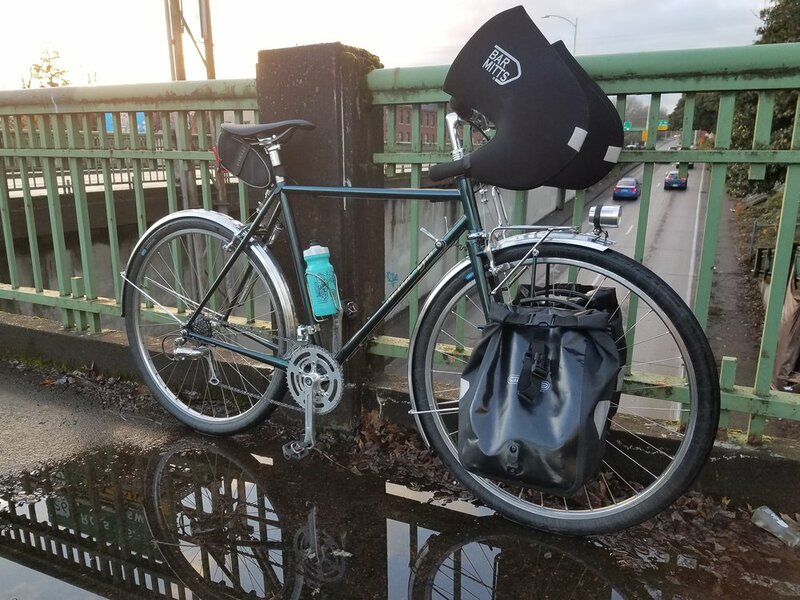 I have not had a front rack before, I have not used a rigidly mounted front bag either. 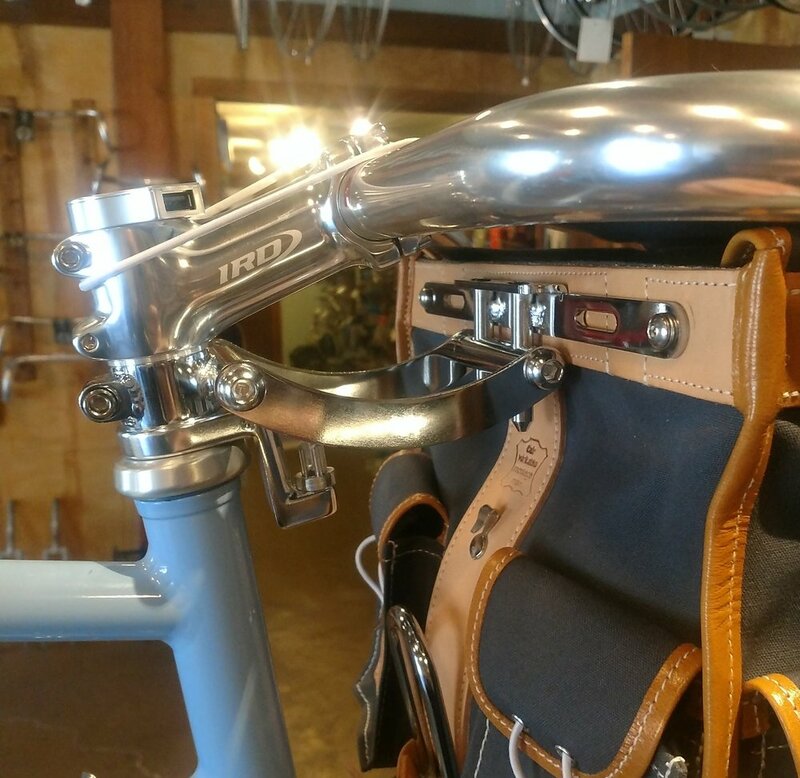 How do I pick stem decaleur bag and rack so they all work together? Now this is a tough one! Totally depends on the size of the bike, quill or Threadless stem, where the rack sits and how high you want your bars! Once we figure all this out we can measure the available space and decaleur options and pick a bag. Other than that this question just has to many variables to give any real answer. Front derailleur mount band or braze on? From pictures it appears to be band. Can you confirm this please? 27.2 the most standard and common size for high end and modern bikes. Yes 130 rear spacing for road 8-10 speed and 11 speed road cassette hubs. Jeff has been building frames since 1974, and specilized in 650b since pretty much the start, but other than that we don’t really have all that much info on him. I was thrilled to open up my email and get the new Torch and File monthly email with this little bit on him. Text and photo stolen from Andy Newlands of Strawberry Cycles fame’s Torch and File Jan 2019 news letter. —Jeff Lyon says: "At the tender age of 18 Jeff flew off to England for what was to become a seven year chapter in his life. During that time Jeff was a category 1 racer, a member of the U.S Cyclo-Cross team and he and another rider broke some English tandem records. It was during this time that Jeff apprenticed under and worked with what could be one of the greatest frame builders who ever lived, Bill Philbrook."